Laksa is a noodle soup popular across south-east Asia and rightly so - it's an all-encompassing soup with a whole host of textures and flavours. Place a wok over a medium–high heat and add the oil. Once hot, add the laksa paste and fry for a minute before pouring in the stock, coconut milk and soy sauce. Bring to the boil then reduce the heat slightly. Simmer for 10 minutes, then add the noodles and cook for a few minutes more until the noodles have softened. Add the carrot and sugar snap peas and allow to simmer for another minute. Serve in deep bowls garnished with bean sprouts, soft-boiled egg halves, herbs, chilli and lime wedges. 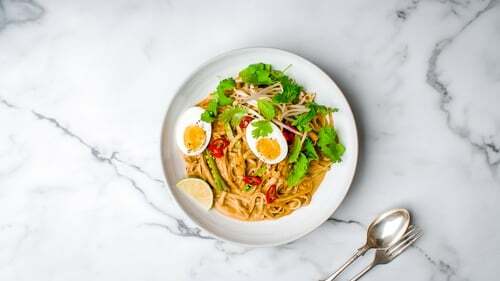 Laksa is a noodle soup popular across south-east Asia and rightly so – it’s an all-encompassing soup with a whole host of textures and flavours. Look for reduced-fat coconut milk with the highest number of coconut solids to give the right depth of flavour and sweetness. If you can’t get hold of laksa paste use Thai red curry paste instead.